PITTSBURGH, (FNN NEWS) By PNC Financial Services Group, Inc. — The PNC Financial Services Group, Inc. (NYSE: PNC) today reported net income of $1.0 billion, or $1.84 per diluted common share, for the third quarter of 2016 compared with net income of $989 million, or $1.82 per diluted common share, for the second quarter of 2016 and net income of $1.1 billion, or $1.90 per diluted common share, for the third quarter of 2015. Total revenue grew $35 million, or 1 percent, to $3.8 billion. Net interest income of $2.1 billion increased $27 million, or 1 percent, due to an additional day in the quarter and higher earning assets partially offset by lower yields. Noninterest income of $1.7 billion increased $8 million driven by fee income growth. Noninterest expense increased $34 million, or 1 percent, to $2.4 billion reflecting business activity and included a new FDIC deposit insurance surcharge as overall expenses remained well managed. Provision for credit losses was $87 million, a decrease of $40 million primarily attributable to stabilization of the energy related portfolio. Loans grew $1.4 billion, or 1 percent, to $210.4 billion at September 30, 2016 compared with June 30, 2016. Total commercial lending increased $1.1 billion, or 1 percent, primarily in PNC’s corporate banking and real estate businesses. Total consumer lending increased $.3 billion due to growth in auto, residential mortgage and credit card loans partially offset by lower home equity and education loans reflecting runoff portfolios. Overall credit quality remained stable with the second quarter. Nonperforming assets of $2.4 billion at September 30, 2016 decreased 6 percent compared with June 30, 2016. Net charge-offs increased to $154 million for the third quarter compared with $134 million for the second quarter. Deposits grew $10.1 billion, or 4 percent, to $259.9 billion at September 30, 2016 compared with June 30, 2016 due to growth in commercial deposits primarily attributable to seasonality. Investment securities of $78.5 billion at September 30, 2016 increased $6.7 billion, or 9 percent, compared with June 30, 2016commensurate with deposit growth. PNC maintained a strong liquidity position. The Liquidity Coverage Ratio at September 30, 2016 exceeded 100 percent for both PNC and PNC Bank, N.A., above the 2017 fully phased-in requirement of 100 percent. PNC returned $.8 billion of capital to shareholders, or 85 percent of third quarter net income attributable to diluted common shares, through repurchases of 5.9 million common shares for $.5 billion and dividends on common shares of $.3 billion. The August quarterly dividend on common stock reflected an 8 percent increase, or 4 cents per share, to 55 cents per share. Transitional Basel III common equity Tier 1 capital ratio was an estimated 10.6 percent at both September 30, 2016 and June 30, 2016, calculated using the regulatory capital methodologies applicable to PNC during 2016. Pro forma fully phased-in Basel III common equity Tier 1 capital ratio, a non-GAAP financial measure, was an estimated 10.2 percent at both September 30, 2016 and June 30, 2016 based on the standardized approach rules. The Consolidated Financial Highlights accompanying this news release include additional information regarding reconciliations of non-GAAP financial measures to reported amounts. Reference to core net interest income, a non-GAAP financial measure, is to total net interest income less purchase accounting accretion, which consists of scheduled accretion and excess cash recoveries, as detailed in the Consolidated Financial Highlights. Fee income, a non-GAAP financial measure, refers to noninterest income in the following categories: asset management, consumer services, corporate services, residential mortgage, and service charges on deposits. Information in this news release including the financial tables is unaudited. Total revenue for the third quarter of 2016 increased $35 million compared with the second quarter and $54 million compared with the third quarter of 2015 as a result of higher net interest income and growth in noninterest income driven by fee income. Net interest income for the third quarter of 2016 increased $27 million compared with the second quarter due to higher core net interest income resulting from an additional day in the quarter and higher securities and loan balances partially offset by lower securities yields. Third quarter 2016 net interest income increased $33 million compared with third quarter 2015 as an increase in core net interest income was partially offset by lower purchase accounting accretion. Growth in core net interest income was attributable to higher securities and loan balances and higher loan yields partially offset by lower securities yields and an increase in borrowing costs. The net interest margin was 2.68 percent for the third quarter of 2016 compared with 2.70 percent for the second quarter and 2.67 percent for the third quarter of 2015. The decrease in the margin from the second quarter was primarily due to lower average rates on net securities purchases and the impact of prepayments. The increase in the margin over third quarter 2015 largely reflected the impact of the December 2015 increase in the federal funds rate. Noninterest income for the third quarter of 2016 increased $8 million compared with the second quarter driven by growth in fee income. Asset management revenue, which includes earnings from PNC’s equity investment in BlackRock, increased $27 million as a result of stronger equity markets. Corporate service fees decreased $14 million primarily due to a lower benefit from commercial mortgage servicing rights valuation and lower capital markets-related revenue partially offset by higher treasury management fees. Residential mortgage banking noninterest income declined $5 million from lower net hedging gains on mortgage servicing rights and lower servicing fees offset by higher loan sales revenue from higher origination volumes. Service charges on deposits increased $11 million attributable to seasonal customer activity. There were no sales of Visa Class B common shares in the third quarter of 2016. Other noninterest income decreased $5 million reflecting the combined second quarter impact of net gains on sales of Visa shares offset by negative valuation adjustments on nonconforming investments under the Volcker Rule. Noninterest income for the third quarter of 2016 increased $21 million compared with the third quarter of 2015 as strong growth in fee income was partially offset by lower other income. Asset management revenue grew $28 million reflecting higher average equity markets. Increases in consumer and corporate service fees and service charges on deposits were attributable to growth in customer activity. Residential mortgage banking noninterest income increased $35 million primarily as a result of higher loan sales revenue from higher origination volumes and increased net hedging gains on mortgage servicing rights. Other noninterest income decreased $56 million due to the impact of third quarter 2015 net gains on sales of Visa shares and lower revenue from private equity investments. Noninterest expense for the third quarter of 2016 increased $34 million compared with the second quarter and included a new FDIC deposit insurance surcharge, the impact of second quarter release of residential mortgage foreclosure-related reserves, increased personnel costs associated with business activities and higher marketing expense offset in part by efforts to control expenses. Noninterest expense for the third quarter of 2016 increased $42 million compared with the third quarter of 2015 reflecting higher variable compensation costs associated with increased business activity and investments in technology and business infrastructure as PNC continued to focus on disciplined expense management. The effective tax rate was 25.4 percent for the third quarter of 2016, 24.3 percent for the second quarter of 2016 and 20.0 percent for the third quarter of 2015. Lower income tax expense for third quarter 2015 reflected tax benefits attributable to effectively settling acquired entity tax contingencies. Total assets increased to $369.3 billion at September 30, 2016 compared with $361.3 billion at June 30, 2016 and $362.1 billion atSeptember 30, 2015. Assets grew 2 percent in both comparisons primarily due to increased investment securities balances. Additionally, higher loans were partially offset by a decrease in deposits maintained with the Federal Reserve Bank compared withSeptember 30, 2015. Total loans grew $1.4 billion as of September 30, 2016 compared with June 30, 2016. Commercial lending increased $1.1 billion in the third quarter primarily in PNC’s corporate banking and real estate businesses. Consumer lending increased $.3 billion reflecting growth in auto, residential mortgage and credit card loans partially offset by lower home equity and education loans driven by runoff portfolios. Average loans increased $.5 billion in the third quarter of 2016 compared with the second quarter. Average commercial lending balances grew $.6 billion and average consumer lending balances declined $.1 billion. Third quarter 2016 period end and average loans increased $5.5 billion and $4.0 billion, respectively, compared with third quarter 2015 driven by commercial real estate and commercial loan growth partially offset by a decrease in consumer loans, including runoff portfolios of residential mortgage, brokered home equity and discontinued government guaranteed education loans. Investment securities balances at September 30, 2016 increased $6.7 billion compared with June 30, 2016 and average balances for the third quarter increased $1.5 billion compared with the second quarter. Portfolio purchases were substantially funded by deposit growth and were primarily agency residential mortgage-backed and U.S. Treasury securities. Third quarter 2016 period end and average investment securities increased $10.4 billion and $9.6 billion, respectively, compared with third quarter 2015. The available for sale investment securities balance included a net unrealized pretax gain of $1.3 billion at September 30, 2016 compared with $1.3 billion at June 30, 2016 and $.9 billion at September 30, 2015, representing the difference between fair value and amortized cost. The increase in the unrealized pretax gain over third quarter 2015 was due to lower market interest rates. Interest-earning deposits with banks, primarily with the Federal Reserve Bank, were $27.1 billion at September 30, 2016, $26.8 billion atJune 30, 2016 and $34.2 billion at September 30, 2015. The decrease from third quarter 2015 was the result of higher investment securities, loan growth and lower borrowed funds partially offset by deposit growth. Total deposits at September 30, 2016 increased $10.1 billion compared with June 30, 2016 and average deposits grew $4.9 billion in the third quarter over the second quarter primarily due to seasonal growth in commercial deposits. Period end and average third quarter 2016 deposits increased $14.9 billion and $9.1 billion, respectively, compared with third quarter 2015 due to overall strong deposit growth. Demand deposits increased, and savings deposits grew reflecting in part a shift from money market deposits to relationship-based savings products. Borrowed funds at September 30, 2016 decreased $3.0 billion compared with June 30, 2016 and average borrowed funds for the third quarter of 2016 declined $.6 billion from the second quarter primarily due to lower Federal Home Loan Bank borrowings. Bank notes and senior debt declined in the comparison with June 30, 2016 and increased in the average comparison as a result of timing of redemptions and issuances. Third quarter 2016 period end borrowed funds decreased $5.1 billion and average borrowed funds declined $4.5 billion compared with third quarter 2015 primarily due to lower Federal Home Loan Bank borrowings and commercial paper partially offset by higher bank notes and senior debt. PNC maintained a strong capital position. Common shareholders’ equity increased compared with June 30, 2016 due to growth in retained earnings partially offset by share repurchases. The transitional Basel III common equity Tier 1 capital ratios were calculated using the regulatory capital methodologies, including related phase-ins, applicable to PNC during 2016 and 2015 using the standardized approach. The pro forma ratios were also calculated based on the standardized approach. See Capital Ratios in the Consolidated Financial Highlights. PNC returned $.8 billion of capital to shareholders through repurchases of 5.9 million common shares for $.5 billion and dividends on common shares of $.3 billion. Repurchases were made under share repurchase programs of up to $2.0 billion for the four-quarter period beginning in the third quarter of 2016. These programs include repurchases of up to $.2 billion related to stock issuances under employee benefit plans. On October 4, 2016, the PNC board of directors declared a quarterly cash dividend on common stock of 55 cents per share effective with the November 5, 2016 payment date. The August dividend on common stock was increased 8 percent, or 4 cents per share, to 55 cents per share. Overall credit quality for the third quarter of 2016 remained stable with the second quarter. Provision for credit losses for third quarter 2016 was $87 million, a decrease of $40 million compared with the second quarter primarily attributable to stabilization of the energy related portfolio. The third quarter 2016 provision included $2 million for loans in the oil, gas and coal sectors compared with $48 million in the second quarter. Nonperforming assets at September 30, 2016 decreased $140 million compared with June 30, 2016 due to lower nonperforming commercial and home equity loans and lower other real estate owned. Included in total nonperforming loans at September 30, 2016were $260 million of nonperforming loans in the oil, gas and coal sectors compared with $293 million at June 30, 2016. Nonperforming assets declined $115 million from September 30, 2015 reflecting improvements in the consumer lending and commercial real estate loan portfolios and lower other real estate owned partially offset by higher nonperforming commercial loans reflecting energy related credits. Nonperforming assets to total assets were .64 percent at September 30, 2016 compared with .70 percent at June 30, 2016 and .69 percent at September 30, 2015. Overall delinquencies as of September 30, 2016 decreased $5 million compared with June 30, 2016. Accruing loans past due 90 days or more increased $12 million, primarily in government insured residential real estate loans, which was more than offset by declines in both the 30 to 59 day and 60 to 89 day categories. Net charge-offs for the third quarter of 2016 increased $20 million compared with the second quarter driven by higher commercial loan net charge-offs across various industries. Net charge-offs for loans in the oil, gas and coal sectors declined to $29 million in the third quarter of 2016 compared with $47 million in the second quarter. Compared with third quarter 2015, net charge-offs increased $58 million due to higher commercial loan net charge-offs. Net charge-offs for the third quarter of 2016 were .29 percent of average loans on an annualized basis compared with .26 percent for the second quarter and .19 percent for the third quarter of 2015. The allowance for loan and lease losses at September 30, 2016 decreased $66 million compared with June 30, 2016 and $618 millioncompared with September 30, 2015. The decline in the allowance from third quarter 2015 reflected PNC’s derecognition of pooled purchased impaired loans, resulting in a reduction of the recorded investment balance included in total loans and the associated allowance for loan losses balance each by $468 million at December 31, 2015. The allowance to total loans was 1.24 percent atSeptember 30, 2016, 1.28 percent at June 30, 2016 and 1.58 percent at September 30, 2015. The allowance to nonperforming loans was 122 percent at September 30, 2016, 119 percent at June 30, 2016 and 149 percent at September 30, 2015. Retail Banking earnings for the third quarter of 2016 decreased in both comparisons. Noninterest income declined reflecting the impact of net gains on sales of Visa Class B common shares in both the second quarter of 2016 and the third quarter of 2015. There were no sales of Visa shares in the third quarter of 2016. Noninterest income included seasonally higher service charges on deposits compared with the second quarter, and growth in both consumer service fees and service charges on deposits compared with third quarter 2015. Provision for credit losses increased compared with the second quarter due to seasonal credit trends affecting the education loan portfolio and continued growth in auto and credit card portfolios. Noninterest expense increased over the second quarter primarily as a result of investments in technology and higher marketing expenses, and included a new FDIC deposit insurance surcharge. Retail Banking continued to focus on the strategic priority of transforming the customer experience through transaction migration, branch network transformation and multi-channel sales and service strategies. Approximately 59 percent of consumer customers used non-teller channels for the majority of their transactions during the third quarter of 2016 compared with 57 percent and 53 percent for the second quarter of 2016 and third quarter of 2015, respectively. Deposit transactions via ATM and mobile channels were 50 percent of total deposit transactions in the third quarter of 2016 compared with 48 percent in the second quarter and 45 percent in the third quarter of 2015. PNC had a network of 2,600 branches and 9,045 ATMs at September 30, 2016. 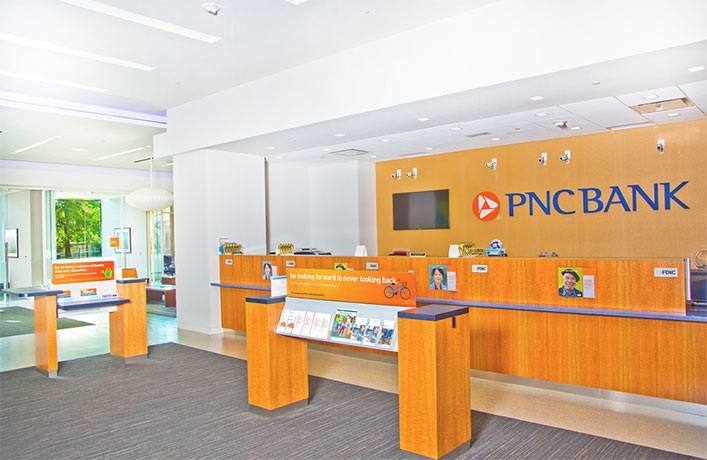 Approximately 18 percent of the branch network operates under the universal model as part of PNC’s retail branch transformation strategy. Average deposits grew 5 percent over the third quarter of 2015 due to higher demand deposits, and an increase in savings deposits which were partially offset by lower money market deposits reflecting a shift to relationship-based savings products. Certificates of deposit declined from the net runoff of maturing accounts. Average loans decreased 3 percent compared with the third quarter of 2015 as growth in automobile and credit card loans was more than offset by lower home equity, education and commercial loans. Net charge-offs for the third quarter of 2016 were $89 million compared with $75 million in the second quarter of 2016 and $66 million in the third quarter of 2015. Corporate & Institutional Banking earnings for the third quarter of 2016 increased in both comparisons. Noninterest income declined from the second quarter primarily due to lower capital markets-related revenue and a lower benefit from commercial mortgage servicing rights valuation partially offset by higher gains on asset sales and higher treasury management fees. Noninterest income increased compared with the third quarter of 2015 principally from higher gains on asset sales, higher treasury management fees and higher corporate securities underwriting activity. Provision for credit losses in the third quarter of 2016 decreased in both comparisons reflecting stabilization of the energy related portfolio and changes in expected commercial default rates. Noninterest expense increased compared with third quarter 2015 as a result of higher variable compensation and other costs associated with increased business activity and investments in technology and infrastructure. Average loans increased 1 percent over the second quarter and 6 percent over the third quarter of 2015 driven by growth in PNC’s real estate business, including both commercial real estate and commercial loans, and increased lending to large corporate customers in PNC’s corporate banking business. Average deposits increased 6 percent over the second quarter reflecting seasonal growth. Compared with third quarter 2015, decreases in average noninterest-bearing demand and money market deposits were mostly offset by interest-bearing demand deposit growth. Net charge-offs of $69 million in the third quarter of 2016 increased compared with $59 million in the second quarter and $26 million in the third quarter of 2015 due in part to charge-offs of previously reserved energy related loans. Asset Management Group earnings for the third quarter of 2016 increased in both comparisons reflecting higher noninterest income driven by higher average equity markets and net business growth. Asset Management Group’s growth strategy is focused on capturing more investable assets by delivering an enhanced client experience, and involves new client acquisition and expanding share of wallet while leveraging its open architecture platform with a full array of investment products and banking solutions for all clients. Key considerations are maximizing front line productivity, a relationship-based focus with other line of business partners, and optimizing market presence in high opportunity markets. Client assets under administration at September 30, 2016 included discretionary client assets under management of $138 billionand nondiscretionary client assets under administration of $128 billion. Discretionary client assets under management increased $3 billion compared with June 30, 2016 and $6 billion compared with September 30, 2015 primarily attributable to equity market increases. Residential Mortgage Banking earnings for the third quarter of 2016 decreased compared with second quarter 2016 and increased compared with third quarter 2015. Noninterest income declined from the second quarter due to lower net hedging gains on residential mortgage servicing rights partially offset by higher loan sales revenue. Noninterest income increased over the third quarter of 2015 primarily as a result of higher loan sales revenue. Noninterest expense increased compared with the linked quarter due to the impact of second quarter release of residential mortgage foreclosure-related reserves and from higher origination costs. The strategic focus of Residential Mortgage Banking is the acquisition of new customers through a retail loan officer sales force with an emphasis on home purchase transactions, competing on the basis of superior service, and leveraging the bank footprint markets. Loan origination volume in the third quarter of 2016 increased 17 percent compared with the second quarter and 12 percent compared with the third quarter of 2015. Approximately 41 percent of third quarter 2016 origination volume was for home purchase transactions compared with 48 percent in the second quarter and 55 percent in the third quarter of 2015. Loan servicing acquisitions were $5 billion in the third quarter of 2016, $6 billion in the second quarter and $10 billion in the third quarter of 2015. The Non-Strategic Assets Portfolio consists of non-strategic assets primarily obtained through acquisitions of other companies and includes a consumer portfolio of mainly residential mortgage and brokered home equity loans and lines of credit, and a small commercial/commercial real estate loan and lease portfolio. The business activity of this segment is to manage the liquidation of the portfolios while maximizing the value and mitigating risk. Provision for credit losses was a benefit in the third quarter of 2016 primarily related to consumer loans compared with a provision in the second quarter which reflected reduced cash flow expectations on certain purchased impaired residential mortgage loans. Charge-offs were in net recovery positions of $6 million for the third quarter of 2016 compared with $2 million for the second quarter and $1 million for the third quarter of 2015. The “Other, including BlackRock” category, for the purposes of this release, includes earnings and gains or losses related to PNC’s equity interest in BlackRock, and residual activities that do not meet the criteria for disclosure as a separate reportable business, such as integration costs, asset and liability management activities including net securities gains or losses, other-than-temporary impairment of investment securities and certain trading activities, exited businesses, private equity investments, intercompany eliminations, most corporate overhead, tax adjustments that are not allocated to business segments, and differences between business segment performance reporting and financial statement reporting under generally accepted accounting principles. PNC Chairman, President and Chief Executive Officer William S. Demchak and Chief Financial Officer Robert Q. Reilly will hold a conference call for investors today at 11:00 a.m. Eastern Time regarding the topics addressed in this news release and the related financial supplement. Dial-in numbers for the conference call are (877) 272-3498 and (303) 223-4371 (international) and Internet access to the live audio listen-only webcast of the call is available at www.pnc.com/investorevents. PNC’s third quarter 2016 earnings release, the related financial supplement, and presentation slides to accompany the conference call remarks will be available atwww.pnc.com/investorevents prior to the beginning of the call. A telephone replay of the call will be available for one week at (800) 633-8284 and (402) 977-9140 (international), conference ID 21816328 and a replay of the audio webcast will be available on PNC’s website for 30 days. Dividends are payable quarterly other than Series O and Series R preferred stock, which are payable semiannually in different quarters. We believe that core net interest income, a non-GAAP financial measure, is useful in evaluating the performance of our interest-based activities. We believe that core net interest margin, a non-GAAP financial measure, is useful as a tool to help evaluate the impact of purchase accounting accretion on net interest margin. To calculate core net interest margin, net interest margin has been adjusted by annualized purchase accounting accretion divided by average interest-earning assets. Calculated as annualized taxable-equivalent net interest income divided by average earning assets. The interest income earned on certain earning assets is completely or partially exempt from federal income tax. As such, these tax-exempt instruments typically yield lower returns than taxable investments. To provide more meaningful comparisons of net interest margins, we use net interest income on a taxable-equivalent basis in calculating net interest margin by increasing the interest income earned on tax-exempt assets to make it fully equivalent to interest income earned on taxable investments. This adjustment is not permitted under generally accepted accounting principles (GAAP) in the Consolidated Income Statement. The taxable equivalent adjustments to net interest income for the three months ended September 30, 2016, June 30, 2016 and September 30, 2015 were $49 million, $48 million and $50 million, respectively. The taxable equivalent adjustments to net interest income for the first nine months of 2016 and 2015 were $145 million and $148 million, respectively. See note (c) on page 15 for additional information. Our business information is presented based on our internal management reporting practices. We periodically refine our internal methodologies as management reporting practices are enhanced. Net interest income in business segment results reflects PNC’s internal funds transfer pricing methodology. Assets receive a funding charge and liabilities and capital receive a funding credit based on a transfer pricing methodology that incorporates product repricing characteristics, tenor and other factors. We consider BlackRock to be a separate reportable business segment but have combined its results with Other for this presentation. Our third quarter 2016 Form 10-Q will include additional information regarding BlackRock. Includes earnings and gains or losses related to PNC’s equity interest in BlackRock and residual activities that do not meet the criteria for disclosure as a separate reportable business, such as gains or losses related to BlackRock transactions, integration costs, asset and liability management activities including net securities gains or losses, other-than-temporary impairment of investment securities and certain trading activities, exited businesses, private equity investments, intercompany eliminations, most corporate overhead, tax adjustments that are not allocated to business segments, and differences between business segment performance reporting and financial statement reporting (GAAP), including the presentation of net income attributable to noncontrolling interests as the segments’ results exclude their portion of net income attributable to noncontrolling interests. Amounts include consolidated variable interest entities. Our second quarter 2016 Form 10-Q included, and our third quarter 2016 Form 10-Q will include, additional information regarding these Consolidated Balance Sheet line items. Amounts include assets and liabilities for which we have elected the fair value option. Our second quarter 2016 Form 10-Q included, and our third quarter 2016 Form 10-Q will include, additional information regarding these Consolidated Balance Sheet line items. See the Tangible Book Value per Common Share Ratio table on page 19 for additional information. As a result of certain investment advisory services performed by one of our registered investment advisors, certain assets are reported as both discretionary client assets under management and nondiscretionary client assets under administration. The amount of such assets was approximately $9 billion, $9 billion and $6 billion as of September 30, 2016, June 30, 2016 and September 30, 2015, respectively. The ratios as of September 30, 2016 are estimated and calculated based on the standardized approach. See Capital Ratios discussion on page 18 and in both the Banking Regulation and Supervision section of Item 1 Business in our 2015 Form 10-K and in the Consolidated Balance Sheet Review section in our second quarter 2016 Form 10-Q. Our third quarter 2016 Form 10-Q will include additional discussion on these capital ratios. See our 2015 Form 10-K for information on our change in derecognition policy effective December 31, 2015 for certain purchased impaired loans. The allowance for loan and lease losses includes impairment reserves attributable to purchased impaired loans. Nonperforming loans exclude certain government insured or guaranteed loans, loans held for sale, loans accounted for under the fair value option and purchased impaired loans. As a result of the staggered effective dates of the final U.S. Basel III regulatory capital rules (Basel III rules), as well as the fact that PNC remains in the parallel run qualification phase for the advanced approaches, PNC’s regulatory risk-based capital ratios in 2016 and 2015 are calculated using the standardized approach for determining risk-weighted assets, and the definitions of, and deductions from, regulatory capital under the Basel III rules (as such definitions and deductions are phased-in for 2016 and 2015, respectively). We refer to the capital ratios calculated using the phased-in Basel III provisions in effect for each year and, for the risk-based ratios, standardized approach risk-weighted assets, as Transitional Basel III ratios. Under the standardized approach for determining credit risk-weighted assets, exposures are generally assigned a pre-defined risk weight. Exposures to high volatility commercial real estate, past due exposures, equity exposures and securitization exposures are generally subject to higher risk weights than other types of exposures. We provide information below regarding PNC’s estimated September 30, 2016 and actual June 30, 2016 and September 30, 2015Transitional Basel III common equity Tier 1 ratios and PNC’s estimated pro forma fully phased-in Basel III common equity Tier 1 ratio. Under the Basel III rules adopted by the U.S. banking agencies, significant common stock investments in unconsolidated financial institutions, mortgage servicing rights and deferred tax assets must be deducted from capital (subject to a phase-in schedule and net of associated deferred tax liabilities) to the extent they individually exceed 10%, or in the aggregate exceed 15%, of the institution’s adjusted common equity Tier 1 capital. Also, Basel III regulatory capital includes (subject to a phase-in schedule) accumulated other comprehensive income related to securities currently and previously held as available for sale, as well as pension and other postretirement plans. Basel III advanced approaches risk-weighted assets are based on the Basel III advanced approaches rules, and include credit, market and operational risk-weighted assets. During the parallel run qualification phase PNC has refined the data, models and internal processes used as part of the advanced approaches for determining risk-weighted assets. We anticipate additional refinements through the parallel run qualification phase. PNC utilizes the pro forma fully phased-in Basel III capital ratios to assess its capital position (without the benefit of phase-ins), as these ratios represent the regulatory capital standards that will be ultimately applicable to PNC under the final Basel III rules. Our Basel III capital ratios and estimates may be impacted by additional regulatory guidance or analysis, and, in the case of those ratios calculated using the advanced approaches, may be subject to variability based on the ongoing evolution, validation and regulatory approval of PNC’s models that are integral to the calculation of advanced approaches risk-weighted assets as PNC moves through the parallel run approval process. Tangible book value per common share is a non-GAAP measure and is calculated based on tangible common shareholders’ equity divided by period-end common shares outstanding. We believe this non-GAAP measure serves as a useful tool to help evaluate the strength and discipline of a company’s capital management strategies and as an additional, conservative measure of total company value. We make statements in this news release and related conference call, and we may from time to time make other statements, regarding our outlook for earnings, revenues, expenses, capital and liquidity levels and ratios, asset levels, asset quality, financial position, and other matters regarding or affecting PNC and its future business and operations that are forward-looking statements within the meaning of the Private Securities Litigation Reform Act. Forward-looking statements are typically identified by words such as “believe,” “plan,” “expect,” “anticipate,” “see,” “look,” “intend,” “outlook,” “project,” “forecast,” “estimate,” “goal,” “will,” “should” and other similar words and expressions. Forward-looking statements are subject to numerous assumptions, risks and uncertainties, which change over time. The impact on financial markets and the economy of any changes in the credit ratings of U.S. Treasury obligations and other U.S. government-backed debt, as well as issues surrounding the levels of U.S. and European government debt and concerns regarding the creditworthiness of certain sovereign governments, supranationals and financial institutions inEurope. Changes in customers’, suppliers’ and other counterparties’ performance and creditworthiness. Continued residual effects of recessionary conditions and uneven spread of positive impacts of recovery on the economy and our counterparties, including adverse impacts on levels of unemployment, loan utilization rates, delinquencies, defaults and counterparty ability to meet credit and other obligations. Changes in customer preferences and behavior, whether due to changing business and economic conditions, legislative and regulatory initiatives, or other factors. Our forward-looking financial statements are subject to the risk that economic and financial market conditions will be substantially different than those we are currently expecting. These statements are based on our current view that the U.S. economy will grow moderately in the latter half of 2016, boosted by stable oil/energy prices, improving housing activity and moderate job gains, and that short-term interest rates and bond yields will hold fairly steady before gradually rising late this year. These forward-looking statements also do not, unless otherwise indicated, take into account the impact of potential legal and regulatory contingencies. PNC’s ability to take certain capital actions, including paying dividends and any plans to increase common stock dividends, repurchase common stock under current or future programs, or issue or redeem preferred stock or other regulatory capital instruments, is subject to the review of such proposed actions by the Federal Reserve Board as part of PNC’s comprehensive capital plan for the applicable period in connection with the Federal Reserve Board’s Comprehensive Capital Analysis and Review (CCAR) process and to the acceptance of such capital plan and non-objection to such capital actions by the Federal Reserve Board. PNC’s regulatory capital ratios in the future will depend on, among other things, the company’s financial performance, the scope and terms of final capital regulations then in effect (particularly those implementing the international regulatory capital framework developed by the Basel Committee on Banking Supervision (Basel Committee), the international body responsible for developing global regulatory standards for banking organizations for consideration and adoption by national jurisdictions), and management actions affecting the composition of PNC’s balance sheet. In addition, PNC’s ability to determine, evaluate and forecast regulatory capital ratios, and to take actions (such as capital distributions) based on actual or forecasted capital ratios, will be dependent at least in part on the development, validation and regulatory approval of related models. Changes resulting from legislative and regulatory reforms, including major reform of the regulatory oversight structure of the financial services industry and changes to laws and regulations involving tax, pension, bankruptcy, consumer protection, and other industry aspects, and changes in accounting policies and principles. We will be impacted by extensive reforms provided for in the Dodd-Frank Wall Street Reform and Consumer Protection Act (the “Dodd-Frank Act”) and otherwise growing out of the most recent financial crisis, the precise nature, extent and timing of which, and their impact on us, remains uncertain. Unfavorable resolution of legal proceedings or other claims and regulatory and other governmental investigations or other inquiries. In addition to matters relating to PNC’s current and historical business and activities, such matters may include proceedings, claims, investigations, or inquiries relating to pre‑acquisition business and activities of acquired companies,such as National City. These matters may result in monetary judgments or settlements or other remedies, including fines, penalties, restitution or alterations in our business practices, and in additional expenses and collateral costs, and may cause reputational harm to PNC. Business and operating results are affected by our ability to identify and effectively manage risks inherent in our businesses, including, where appropriate, through effective use of third-party insurance, derivatives, and capital management techniques, and to meet evolving regulatory capital and liquidity standards. In particular, our results currently depend on our ability to manage elevated levels of impaired assets. We grow our business in part by acquiring from time to time other financial services companies, financial services assets and related deposits and other liabilities. Acquisition risks and uncertainties include those presented by the nature of the business acquired, including in some cases those associated with our entry into new businesses or new geographic or other markets and risks resulting from our inexperience in those new areas, as well as risks and uncertainties related to the acquisition transactions themselves, regulatory issues, and the integration of the acquired businesses into PNC after closing. Competition can have an impact on customer acquisition, growth and retention and on credit spreads and product pricing, which can affect market share, deposits and revenues. Industry restructuring in the current environment could also impact our business and financial performance through changes in counterparty creditworthiness and performance and in the competitive and regulatory landscape. Our ability to anticipate and respond to technological changes can also impact our ability to respond to customer needs and meet competitive demands. Business and operating results can also be affected by widespread natural and other disasters, pandemics, dislocations, terrorist activities, cyberattacks or international hostilities through impacts on the economy and financial markets generally or on us or our counterparties specifically. We provide greater detail regarding these as well as other factors in our 2015 Form 10-K and our 2016 Form 10-Qs, including in the Risk Factors and Risk Management sections and the Legal Proceedings and Commitments and Guarantees Notes of the Notes To Consolidated Financial Statements in those reports, and in our subsequent SEC filings. Our forward-looking statements may also be subject to other risks and uncertainties, including those we may discuss elsewhere in this news release or in our SEC filings, accessible on the SEC’s website at www.sec.gov and on our corporate website at www.pnc.com/secfilings. We have included these web addresses as inactive textual references only. Information on these websites is not part of this document.